"A Star is (Not) Born"
Yes, technically a Star of David is two triangles intersecting, Bugsy - but not like this. And I think you can lay off the "poiple" icing now, too. As you can see, this traditionally-colored flaming whirlwind knocked the wording about and blew the second 'k' clean off. Of course, if for the sake of argument we called this a "menorah", then it's also missing a candle. The fact that the "candles" look like Christmas trees is just the icing on the, er, cookie. Mazel Tov! How much you wanna bet this bakery has a bin of "Christmas Stars" in the back? Thanks to Ebony W., Shanna M. and Frank R.! that last cake made me laugh out loud! sigh ! Did you notice that the first one with the star of david seems to be an upside down cupcake christmas tree? On cake #3 I'm thinking the person at the bakery thought, "I'm sick of all the 'Season's Greetings', 'Happy Holidays', 'Happy Hanukkah' euphemisms. I'm putting 'Merry Christmas' on all the cakes because that's what everyone is celebrating!" Maybe the third one could be for a mixed-religious household. That's the excuse I'd use if I was the lazy and/or confused person who made it. I'm not even Jewish and I'm offended. Nah, maybe just amused at what people will put on a cake to try to sell it. I really got the feeling that someone had sneezed right between "HANU" and "KAh." If so, it *could* just explain how the glimy-gloobery got there. The little trees /whatnots were an attempt to make it represent an actual something-or-other, like a pedestal on which we have little green pinecones wearing hats. Or the Seven Dwarfs plus a new recruit. I shouldn't come here before I've had my coffee. Actually, I don't notice anything wrong with the first. It's not lovely, but it's adequate. I guess that last cake is nice because it sort of includes both groups. Really that thrid one was probably a Chrismakkuh cake inspired by Seth Cohen of The O.C. :) At least, thats the sotry I'd use if I was the one selling the cake. Very cool knowledge- I never knew that. That said, are you sure you aren't giving the decorator too much credit...? In other news, I like how the "Merry Christmas" looks stuck on there like an afterthought, heh. What are the white spidery-legs looking things in the third picture? I'd much prefer 'Gentile' to 'Goy'== I've run across too many offensive uses of the latter. I love your blog. It has brought me more joy than I can tell you; sometimes a good laugh can change everything. Thank you. I'm pretty impressed the Teal Tornado "bakery" seems to think it was good enough to deserve the display holder! LOL "Wow! That's a really good one! Maybe the best we've got!" Goy is basically Gentile in Hebrew. Nothing more, nothing less. Jews for Jesus, the cake version. I love that you include all sorts of winter holiday cake madness. 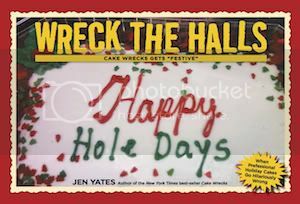 It's really refreshing to see someone who considers many holidays, even if kwanzaa cakes are really hard to find. ps. what the heck is a Snotion (my verification word)? Is that like a snot station all mushed together? I think the 3rd cake is a very clever marketing ploy...anyone can buy it and just remove what they don't need...deviously clever, appeal to everyone. I like the last one. I would totally buy that one, especially if I were invited to a Kwanzaa party I could bring it to. Verification word is "unispe" as in UNIted SPEcial occasions. Plenty of Christian/Jewish families would love that last cake but holy moly is that a hilarious mess. I suspect that the decorator did in fact have "Christmas stars" in the back and just stuck them on. The unholy CCC has reared it's hideous head in the form of the malformed Star of David. Which really is not that hard. Come on. I'm not even Jewish and I'm annoyed at that one. It's just lazy decorating. I'm thinking on cake #3 the "spider leg" things are papers to separate the slices, no? The first one really scares me. Not only is it a CCC *runs from the room screaming* but it truly is very hard to mess up 2 triangles. 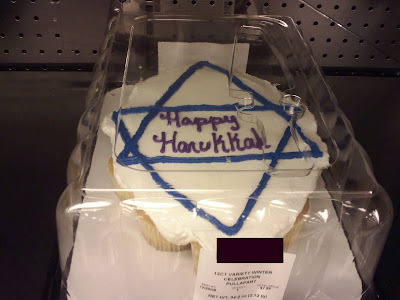 The last cake could be for/by Messianic Jews, who accept Jesus was the Messiah and still keep their Jewish customs, like Chanukka, pesoch, and everything else. Cool religion, imho. Ick...the whole lot of them. wvotd...merpric...is that a merman who is a ? Word verification: misiolob. 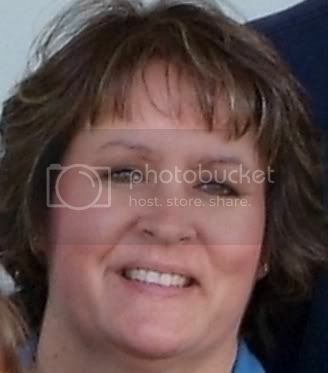 What someone who had a lobotomy is missing. You missed Sandra Lee's Hanukkah cake, from the same episode as the Kwanzaa football cake. Oy vey indeed. I second that the "spider leg" things on cake #3 are papers to separate the slices. It's common for prefab cakes designed to be sold by the slice to have those, although the extra decoration on top baffles me. Word verification: parch. What happens to your mouth when you eat stale cake. SACRILEGE! SACRILEGE! Somebody stop this politically correct #@$% People are getting religiously confused and it's NOT FUNNY! Okay, well, maybe it is, a little....... BUT IT'S STILL NOT RIGHT!!!!!!!!! Wait--I know who that last cake is marketing too. I have a couple friends who married each other despite religious differences. She is Christian, he is Jewish. This time of the year they celebrate both religious holidays, so this would be the perfect cake for them! I would so totally buy the Merry-Christmas-with-Jewish-stars cake, but then again I'm insane. Word verification: precave. I would not be surprised if at least one of these wrecks caved in upon being touched. Store-bought cakes weren't really part of my chanukah experience - homemade sugar cookies decorated with pale blue sugar, were. Forget the inscription. That last cake looks like a "Face Hugger" from Alien! "Merry Chrstmas....AAAAAAAGHH!!!" You found some!! I think the one with Merry Christmas and the Stars of David would probably go over well in my blended family- I'm Jewish, hubby's not. All I can really say is that at least none of them misspelled Hannukah, unless you count the "Merry Christmas." 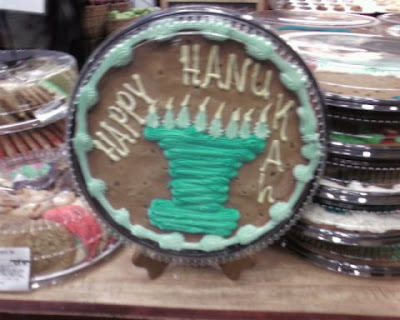 The menorah, though, was a huge glaring error. Sooo... the decorator of the tornado took the word "branches" to heart. But forgot one! Soooo funny!!!! Why on Earth is the last "h" in "HANUKAh" lowercase when EVERY OTHER LETTER ON THE COOKIE IS UPPERCASE!? That last cake would have been great for me growing up -- My mom's Jewish, Father's Catholic, so we celebrated both holidays. Reminds me of one year when my mom gave me a huge teddy bear for Chanukah -- it had "Merry Christmas" sewn on it. She got a lot of teasing from me about that. Maybe the last cake is a chrismukkah cake! If the last one is supposed to be a cake for both Christmas and Hanukkah, it's an absolute failure. I bet even my non-baking sister-in-law could do a better job. Whoever decorated that cake needs to be slapped 10x in a row. I'm just writing to voice my approval of the "Hanukah" spelling. It's not exactly wrong, though it is uncommon. By the way, since we grew up in a Jewish/Christian household, that last cake would have been spot on. But it is just plain weird. WV: tryst. Seriously. As in my daily "tryst" with Cake Wrecks, some things just make sense. I'd also like to point out that 'Hanukah' with one K isn't wrong - anything that is a transliteration from another language merely has an approximation in English. The proper spelling, is of course, in Hebrew. For example al-Qaeda/al-Qaida are both 'right' although any one publication might have a preffered transliteration. haha! I want that religiously-confused cake for my half-Jewish family's Christmas dessert! But Where are the Blue Birds? How Many Blogs Have Tribute Parties? 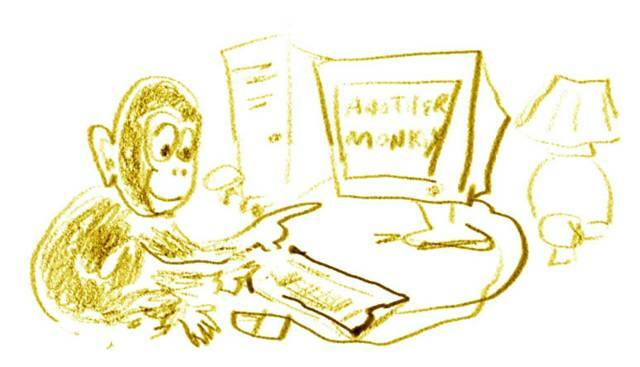 What Do You Get for an Investment Banker?